Learn about some of the special puzzles we have made over the years. Special occassions or a special day?? We can cut a custom puzzle from a photo, an invitation or even a collage of items, for weddings, birthdays, holidays, anniversaries, or favorite vacations. You can even give a gift certificate and have the lucky recipients pick out the picture. Click here. 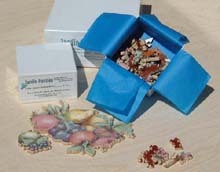 Welcome to Jardin Puzzles, makers of unique, personalized, quality-crafted wooden jigsaw puzzles. Our puzzles are made from fine art prints shown in our gallery or from images sent in by our customers. 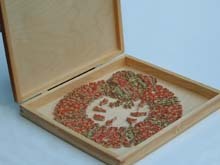 Every puzzle is hand cut, one piece at a time, using the finest quality woods and a variety of skilled cutting styles and techniques to make a puzzle that is both unique and enjoyable. Our puzzles are made primarily for adult puzzle enthusiasts and collectors, but can be adapted for school-age children too. A Jardin Puzzle is an original and memorable gift for special occasions such as: birthdays, holidays, weddings, anniversaries, corporate favors, or just the right thing for that person who has everything. Jardin Puzzles are meant to be admired as art for their craftsmanship and enjoyed for the challenge and fun of putting them together. Given proper care, they are meant to last for generations. Our puzzles come in all shapes and sizes. 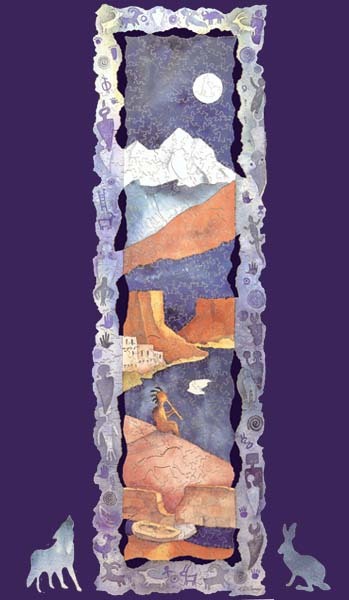 The challenging puzzle below is done from a reproduction of the watercolor, Kokopelli's Serenade, by Kathy Cooney. We took a rectangular picture and created a puzzle that has the shape of old, frayed parchment. The outside egdes are very irregular, and the dropouts (intentional holes in the interior of the puzzle) between the border of the print and the Kokopelli image, make it even more challenging. As with many of our puzzles, we designed special figural pieces that are included in the puzzle. Two are shown, the wolf and jack rabbit. There are nine more woven into the puzzle. You can click on the image below to read more about the puzzle or to order one for yourself. 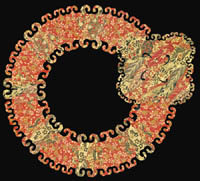 Shown with two of eleven figural pieces. 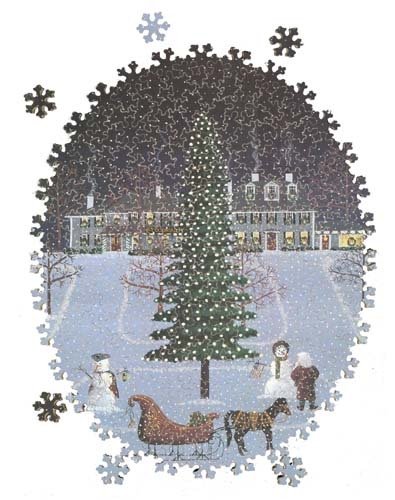 New for winter 2002/2003 is this very intricate puzzle, Colonial Inn , a Limited Edition print by Colleen Sgroi. This wonderful print has Santa chatting with Mr. and Mrs. Snowman, with his horse and sleigh waiting to take off. It's snowing in the picture and it's definitely snowing in the puzzle. There are 48 snowflakes within, without and on the border of this puzzle. Forty six of them are the same size. They only fit one way, that is, except for six that you can arrange around the puzzle. Click on the picture to learn more of this puzzle and to order it. But give me a lot of lead time, 48 snowflakes take a while to cut! All of our puzzles are cut from flawless, top-grade, 1/4-inch mahogany plywood. Not only is it perfect on either side, there are no interior defects in the core. After mounting either a print, photo or other artwork to the wood, we hand-cut your puzzle, piece by piece, to your specifications. To get a tight fitting puzzle and the intricate small pieces of our cutting styles or your chosen figure pieces, we use a special blade that is only 8 thousands of an inch wide. Unless otherwise requested, we also include our signature piece, a stylized iris, which our cutter, Melinda Shebell, has signed on the back, with a number and date, to ensure authenticity. Once cut, your puzzle is assembled and inspected. The back is sanded and hand finished with multiple coats of oil and shellac to bring out the rich luster of the mahogany grain and to give the pieces a soft texture when putting the puzzle together. We make sure the back of the puzzle is as nice to look at as the front. Our puzzles are packaged in specially designed, sturdy, secure white gift boxes (see picture below). The two piece box has overlapping sides so that if dropped, the box remains closed with no spilled pieces. The box can even withstand liquid for a few seconds protecting the puzzle within. Each box has a custom-label with the title, dimensions, number of pieces, and the date it was cut. Our Limited Edition Wreath of Music puzzle comes in a custom-made, hinged, wooden box that allows the puzzle to be stored assembled in the wreath shape or unassembled as desired. The process of mounting the print, cutting the puzzle, finishing the back, and boxing and labeling usually takes two weeks. It may take longer for larger puzzles or during holiday seasons. When we confirm your order, we will give you a firm quote on the time. Because all our puzzles are created by hand, they cannot be rushed. Please order a custom cut puzzle well in advance. If you would like a puzzle immediately, we do have a list of Ready-to-go puzzles. However, we don't "stock" puzzles so this list is limited and varies over time. Email us as the address below for a list of what is currently available. 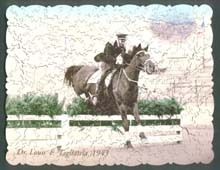 You can browse the Gallery to see the most recent images we offer for puzzles, including works from current artists, and antique image reproductions from Melinda's personal collection. If you have a print or photo you would like made into a puzzle, go to Puzzles from Your Pictures to see how to have a unique puzzle custom made from your artwork. Once you've decided on an image for your puzzle we offer the widest variety of options for customizing your puzzle including different edge styles and cutting styles, specially designed figural pieces, color-line-cutting, and more. Ordering, pricing and shipping information can be found on the Order and Pricing info page. If you're interested in a little bit of the jigsaw puzzle history and where to go for more information see our History and Links page. About us will tell you more about our company and history. So please enjoy our site, and drop us a line if you have any questions.